As the 2011-2012 NBA Schedule to be released today at 7:00pm Eastern, SeatGeek is putting together a guide to help you score tickets to some great matchups. With less games this season and some blockbuster trades in the talks, demand for tickets will no doubt be at a premium. First let’s take a look at last year’s most demanded games. The matchup of the Kobe and his Lakers against Dwayne Wade’s South Beach Super Team takes the cake when it comes to the most expensive ticket last year. In regards to the teams we see here, there’s not much diversity with the top games from last year. The are no real surprises that we see the 2009-10 Champions Los Angeles Lakers as well as Eastern Conference Champions Boston Celtics in the most demanded games. Same goes with the Miami Heat with Lebron James and Chris Bosh joining Dwayne Wade. The New York Knicks also acquired the highly coveted Amar’e Stoudemire and later Carmelo Anthony to add star power to their starting five. And the reason the Rockets are on this list is because it was the Lakers home opener and championship ring ceremony. 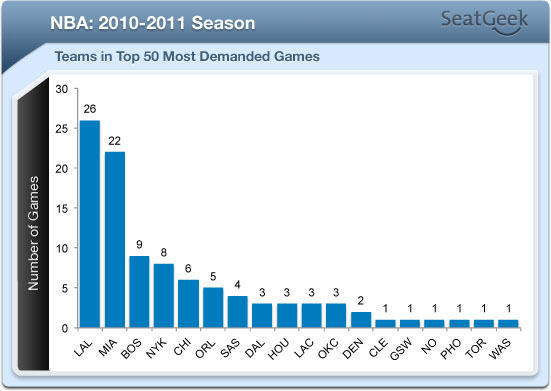 If we expand and look at the data from the top fifty games last season, you see more of the same. There’s a ridiculous increase in high demand for both the Heat and the Lakers. The top four teams figured in every single permutation of the top fifty games. That’s right – so every highly demanded game for the Chicago Bulls was because their opponents were either the Lakers, Heat, Celtics or the Knicks. All these four teams have a bevy of talent bolstering their teams. The Celtics got the ball rolling with the Boston Three Party in 2007 by acquiring Ray Allen from the good ol’ Seattle SuperSonics and Kevin Garnett from the Minnesota Timberwolves. Not to be outdone, the Lakers finagled Pau Gasol from the Memphis Grizzlies the next year during the 2008 offseason. And the Knicks and Heat have already been mentioned before. Yeah yeah, I know that LeBron didn’t bring home any championships last year. But the heat ran through the Eastern Conference much like the Celtics did in 2009-2010. The Lakers were defending champs and the Knicks…well…they made the playoffs. So people like to see really good athletes and winners. Great deduction there. All I’m saying is that you should expect to pay a premium for these teams. They may lack the star power, but people love winners. Expect any game that includes the Dallas Mavericks to cost you a premium. Especially when led by a dirty dancing Dirk Nowitzki. I’m sure many people show up to Heat away games just to hate on this team. They made were in the Finals last year, made fun of Dirk for having the flu, and plain got outplayed by a team. Not just three NBA stars and a couple of bench players. Emphasis on old for the first two teams. These teams have ravenous fan bases and always the potential to attract marquee players. Whether it’s Chris Paul to the Knicks, Chris Paul to the Celtics, Dwight Howard to the NetsChris Paul and Dwight Howard to the Lakers, expect one of these big three teams to make a significant move. I threw in the Clippers for good measure since they’re also linked to Chris Paul and Dwight Howard. All of these players currently have a stud player (or two) on their roster (Derrick Rose, Deron Williams, Kevin Durant, Blake Griffin) and would easily compete with plenty of star power. Basically, if any of these teams end up with either Dwight Howard, Chris Paul or both, expect giddiness on par with the self-proclaimed Superman. So as we eagerly await the release of the NBA Schedule for 2011-2012, keep an eye on free agency and here at SeatGeek to find out which way the ticket prices are moving. We’ll help you get in when the getting in is still good (and save you some money along the way!). And for good measure, here’s another dancing video of the originator of big men dancing. I’ll miss you the Big Aristotle. The Big Shaqtus lives on and will always Superman to me.